The familiar native rose of hedgebanks. 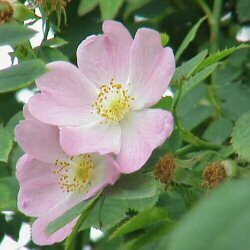 The Dog Rose can be grown in any soil and often grows well in heavy, cold soils. With pink flowers and bright red hips, a welcome sight in any hedge, screen or garden. Expect a height of 3m.